This article, written by the Rev. Dr. Stuart Baskin, was originally published in the November issue of the Steeple Times following the installation of the solar-powered water filtration system at St. Etienne in Haiti. The project was done in partnership with Solar Under the Sun, Living Waters for the World, and Central Presbyterian Church of Fort Smith, Arkansas, and was completed October 8–13, 2014. 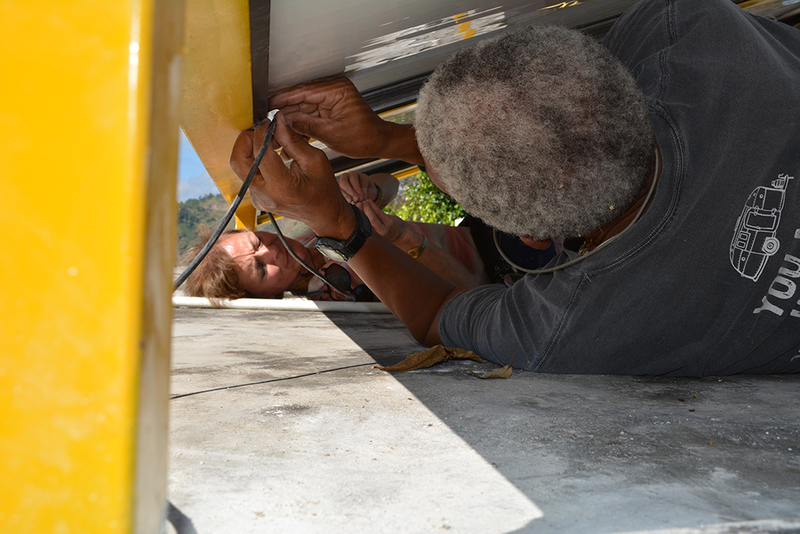 Sally Smith Garmon and a member of the St. Etienne community install roof-top solar panels. As I write these words, I am both elated and exhausted after our church’s latest trip to Haiti to “bring good news to the poor.” As you know, our Mission Committee has, with the blessing of the Session, entered into a long-term mission in Haiti to install water purification and solar-power systems at select sites in that nation, the poorest in the western hemisphere. These systems are designed to provide water that is safe for human consumption by drawing water through a series of filters which are powered by electricity generated by solar panels. The modest aim is not to put running water or electricity into individual homes, but—by working with local churches—to provide a central place where villagers can come to fill their water jugs. Four of us from FPC Tyler went on this trip, including Sally Smith, Ginny Mattox, Dan Daniel, and myself. We were met by three members of Central Presbyterian Church in Fort Smith, Arkansas, and an observer from Lumberton, North Carolina. Together, we successfully installed both the water and the solar-power systems at the church in the little community of St. Etienne du Buteau, about twenty-two miles as the crow flies west-southwest of Port au Prince. Students gather at St. Etienne's open-air school house which doubles as a worship space. Of course, the most important work was not just the technical matter of bringing electricity and clean water to this poor community, but the relationships that we have begun building. Words cannot express the thanks of our mission team for the generosity of our church in providing the means to make this project happen. We were all aware that for each one of us, there were dozens of others standing behind us, lending us support and prayers. We will provide a fuller report to you once we catch our breath and debrief. But for now, just know how much your efforts are appreciated!